The disenchantment of the middle class is often cited as a contributor to the downward slide in the ANC’s popularity in urban areas. KwaZulu-Natal bucked the trend in the last national elections, but the impact of deadly factional battles in the province has caused uncertainty about whether the ANC still enjoys overwhelming support. Deputy President Cyril Ramaphosa was in KwaZulu-Natal this week and had the opportunity to interact with black professionals and business people. If the discussions were anything to go by, KZN’s “clever blacks” are not as concerned about the big issues as you might expect. By CYRIL MADLALA. By all accounts, President Jacob Zuma’s fortress that is the ANC in KwaZulu-Natal is a hugely divided house in the aftermath of the provincial conference in November that elected the current leadership under Sihle Zikalala. Among the 57 independent candidates in the eThekwini metro, which forms the ANC’s biggest region in the country, are disgruntled ANC members unhappy with the party’s internal electoral processes that identified candidates for the August 3 elections. They include former deputy metro mayor, Mveli Mavundla. Across the province, there has been a breeze of unhappiness about certain “imposed” candidates. In three wards, ANC supporters will be voting for murdered candidates. Intra-party conflict is suspected. 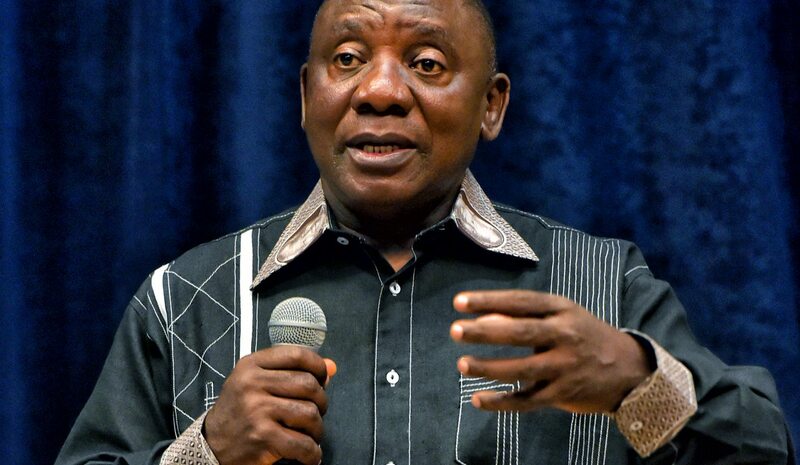 But if the organisation is panicking, it was hard to tell when Deputy President Cyril Ramaphosa sat down with Durban’s professionals this week to enlist their support ahead of the elections. Members of the Black Management Forum and the ANC-aligned Progressive Professionals Forum were joined by public servants, business leaders, doctors, advocates, entrepreneurs and tenderpreneurs, accountants and such types – all very “clever blacks”, if you asked President Zuma. The ever-deferential Ramaphosa said he was inclined to talk less and listen more to the “intellectual input” from this audience. These were, after all, representatives of the typical black middle class that is said to be disaffected with Zuma’s ANC with its baggage of Nkandla, the SABC, the woes at some key state-owned enterprises, etc. Yet, in introducing Ramaphosa, Zikalala was forthright and bold: the ANC is going to win the elections in KwaZulu-Natal and will not be deterred by the killing of its candidates. The Independent Electoral Commission has indicated that by-elections would be held within 90 days after the polls if a deceased candidate won. Following a gruelling door-to-door campaign in various parts of the province, an upbeat Ramaphosa gave a distinct sense that interactions with communities on the ground indicated clearly what was paramount in the minds of ordinary people: service delivery in the form of electricity, housing, water, sanitation and roads. That is why, he said, a key message of the ANC was to trumpet the “real revolution” of a government that provided a free house with a ceiling, electricity and a toilet as it sought to deliver the kind of life envisaged in the Freedom Charter. And so Ramaphosa engaged with the “clever ones”. He need not have feared that he would have to answer awkward questions about Number One or about his own ambitions to ascend to the higher office. He need not have worried about having to share his thoughts about Hlaudi Motsoeneng’s steering of the SABC ship. The presence in the audience of the ever-colourful Communications Minister Faith Muthambi, who was duly acknowledged, was also not enough to jolt memories about the crisis in Auckland Park. What emerged though was that it was disunity within the ANC that posed the biggest threat. According to Zikalala, problems within the organisation’s regional executive structures translated into problems in the local government sphere, while conflicts at provincial executive levels impacted on the performances of the legislatures and executive councils. He was critical, however, of ANC supporters who complained from the sidelines and did not engage themselves in organisational programmes and activities, yet had a lot to say about what was wrong with the party. Many were now resident in formerly whites-only suburbs, yet were disdainful of the very ANC that had made it possible for them to move there. Therefore, as if to make up for abandoning the townships to settle in leafy suburbs, someone suggested to Ramaphosa that the progressive professionals should “reconnect” with the masses and offer mentorship to young people who needed role models. That got a nod from Ramaphosa. And so was an idea from one doctor that since shebeens and shops these days opened even on Sundays, why couldn’t the same apply to libraries? We then got to know that the computer that the deputy president uses was custom-built by a South African young man who also does all the upgrades. A member of the audience employed by a local municipality had wanted to know why the country did not produce its own computers since local bush technicians could fix them anyway. One notion Ramaphosa was particularly keen to take forward and investigate was the “morality of profit”. An entrepreneur told the deputy president that while it was good to boast about the four-million houses the government had built, the figure could have been doubled if construction companies were satisfied with “reasonable” profits. For example, while government paid R100,000 for a house, some business companies were making as much as R40,000 profit for that one unit, thus depriving more people of resources. These “super profits” needed to be looked into, Ramaphosa promised. And the discussions went on. No heated exchanges about the Guptas or Nhlanhla Nene’s dismissal. That was all water under the bridge and non-events for the purposes of this election. So certain was the ANC of victory that the progressive intellectuals offered no thoughts about the threat posed by the opposition or disgruntled communities. The burning barricades in the townships in protest against the choice of some councillors are a foreign phenomenon in the suburbs that the majority of the audience retired to after the engagement with the deputy president.